FEEDING: What do ferrets eat? The Ferret is a true carnivore, its teeth are designed to crunch, rip and tear. Feeding your ferret as it would feed itself in the wild is by far the best method but is not always practical for many ferret owners. The choice of menu available is wild rabbit, hare, game birds, and fish to name but a few. Many ferret owners, especially those of us who hunt shoot and fish do have the opportunity to fill their freezer with this kind of food to keep them going all through the year. Some ferret owners in today's modern society would find this totally unacceptable. Due to the popularity of the ferret as a pet, many food manufacturers have developed a dry kibble type food; try to check that the protein levels are between 35-40% and fat levels between 15-20%. 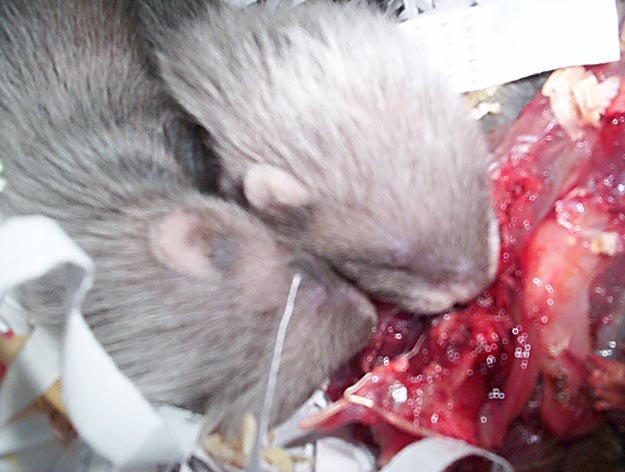 Beware of feeding your ferret sweet treats, as these can be fatal, especially grapes or raisins. Always remove uneaten raw meat from any cages or hide-holes. Ferrets do tend to store food for another day and the chances of food poisoning are high. 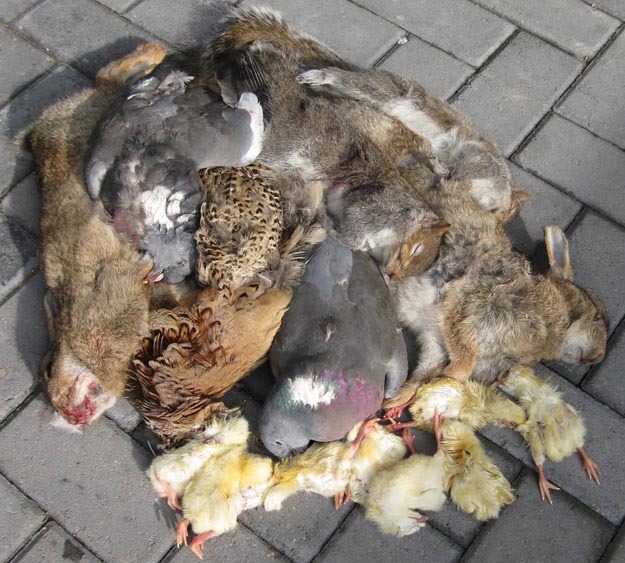 Here is a small selection of natural food that ferrets love to eat, Rabbits,Pidgeons,Squirrels,Pheasant and some day old chicks.We only feed chicks once a fortnight and they are ideal if you need to defrost something quickly.We also feed Duck,Venison, Canadian geese and Fish such as freshly caught Pike. These kits are 3-4 weeks old and eating meat which their mother has taken in to the nest.